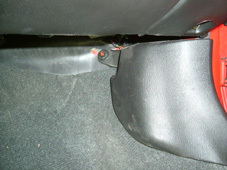 Here is an typical installation of the Autronic PnP install in a EVO6. 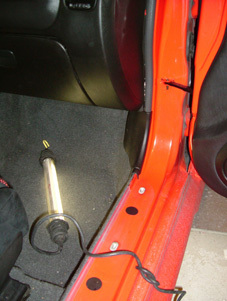 The ECU is located inside the right door, remove the ground from battery before starting work on the car. 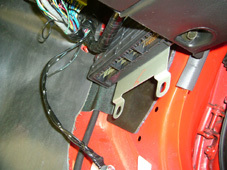 Behind this plastic the ECU is located. On the upper screw two ground wires are located. Important to re-assembly them with same bolt and same place !! 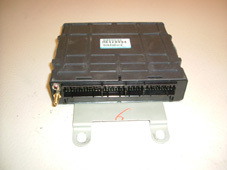 Remove the screws and pull down the old ECU. 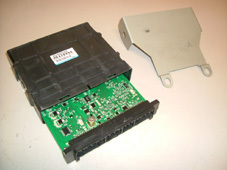 Here is the old ECU with the new Autronic PnP. 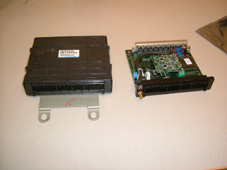 Loosen the holder and open the ECU case and remove the old board. The new PnP board installed. Newer boards has solder jumpers for yaw control and immobilizer. 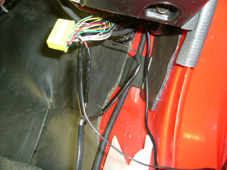 Install the Autronic air temp sensor in the 90 degree bow. Remove the pipe from the engine. Drill a 9 mm hole where the pipe is thicker and use a 1/8 NPT tap. Re-install the pipe after you clean it carefully. 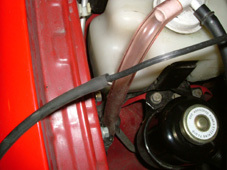 The wire from the air temp sensor and vacuum hose should now be drawn back to the ECU. 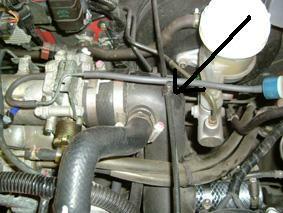 Stock air mass sensor can then be removed. Always remove the connector from the air mass sensor even if you keep it in place. One way of getting the vacuum hose thru the firewall is to use the rubber grommet on the right side. Cut the grommet and use a 2,5 mm2 wire and insert it until it comes out above or below the heater inside. Use hot melt adhesive in the vacuum hose, insert the 2,5 mm2 wire and let cool. Love the hose and gently drag thru the firewall. Then you drag the air temp wires into the ECU in same way. 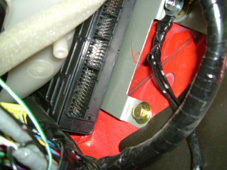 Connect the air temp sensor to pin D2 and ground to D22. Do not remove the other ground wires from pin 22 (TPS/Water temp). Connect the PC and check that every value seems normal. Upload the proper cal file and MAKE SURE THE COOLING FANS ARE WORKING ! Now it is time to tune the engine!! Last edited by MRMRacing; January 12th, 2016, 07:31 PM. All times are GMT1. This page was generated at 08:22 PM.